If you look back at my last post you will see that we celebrated my mom’s birthday this past weekend. I talked about the yum yum bars that I brought to the party, plus all of the other goodies that were at the celebration. Well, I wanted to talk about this spinach dip; this was another thing that I brought to the party, along with a ton of vegetables. I didn’t want you thinking that my family celebration didn’t include some healthy foods to go along with all of the goodies that we eat. Here is the story. Usually, I like to buy the packet of vegetable dips that you mix with sour cream. I know not real cool for a food blogger to stoop to this level, but hey they work when you don’t have a lot of time. Okay, I guess I have to be honest here; I actually bought one of those packets for this party too, because I wanted a little variety and I knew I wouldn’t have time to make two homemade dips. 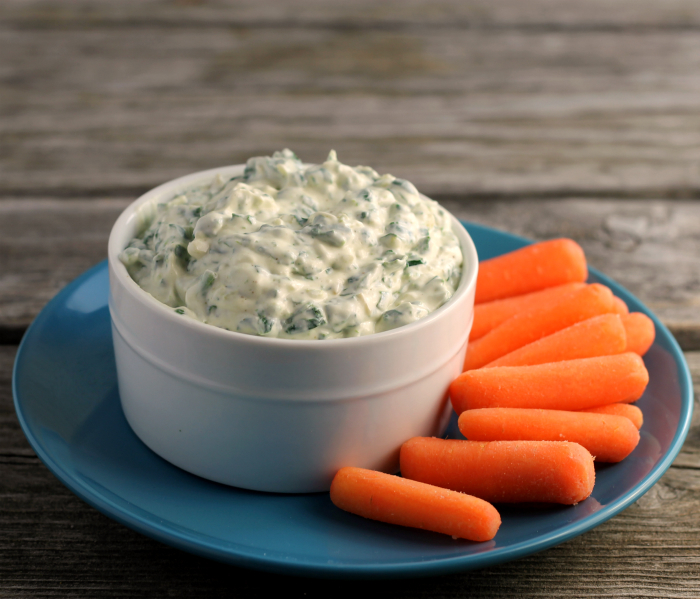 Well, enough with all the confessions and stuff let’s get to the spinach dip. 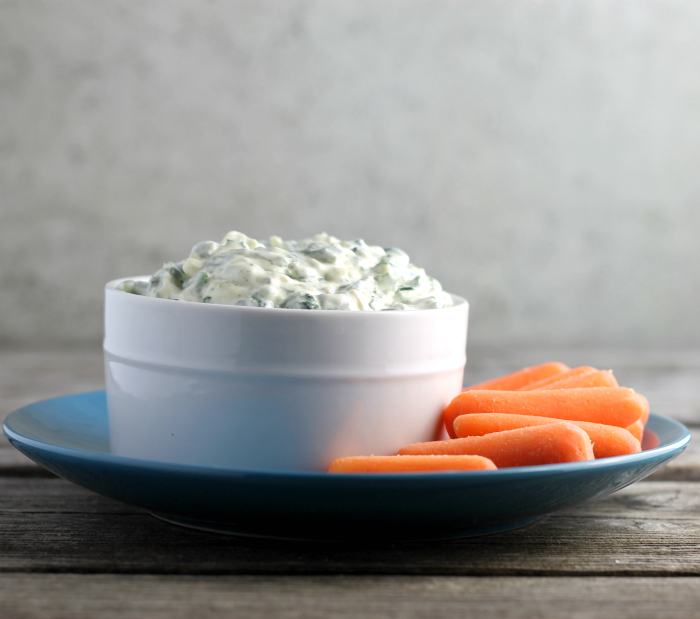 I thought long and hard on how I wanted to make this dip. I wanted something simple, but something with great flavor. To give the spinach more flavor I added green pepper, garlic, onion, and celery salt to the mix of things. I just love the flavor of celery salt, it makes things taste better, at least, I think so. To let you know everyone was eating the spinach dip and the dip with the store bought mix, well that one didn’t go as well. I had several people tell me that they loved my spinach dip. I love it when people tell me that they like my recipe! Heat the olive oil in a skillet over medium heat. Add the garlic, onion, and green pepper. Cook the vegetables for about 5 minutes or until the start to get tender, making sure to stir them so they don't burn. Once the vegetables are tender add the spinach and continue to cook until the spinach is wilted and reduced down. Remove from the heat and allow to cool completely. Once the spinach mixture is cooled put into a food processor and process until smooth. I used a mini processor works well. In a small to medium bowl add the sour cream, dressing/mayonnaise and spinach mixture mix until well blended. Add the celery salt and mix in. Season with additional salt and pepper to taste. It is good to refrigerate for an hour or more to let the flavors blend together. Hi Dawn, I agree, a good dip helps the veggies disappear and this certainly looks like a very good one. Sounds like there is a lot of good food at your family get togethers. 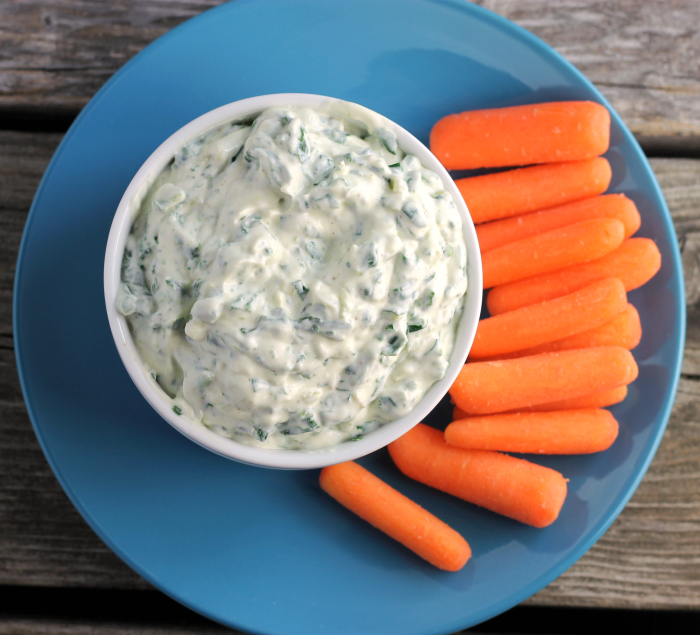 This is a great idea for using spinach, not thought of using it as a dip before! I’m a real dip queen!! 🙂 and… carrots are my favourite. I’ll definitely try your spinach dip. Seems so yummy! 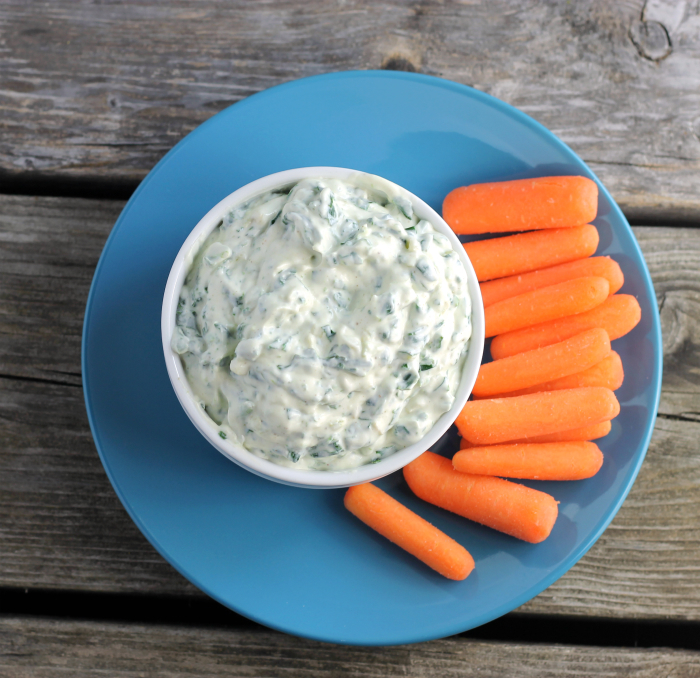 I DO love that spinach dip made with soup mix—but I haven’t made it in a long time. I’ll definitely try your version next! Perfect for veggie dipping. Belated birthday wishes to your mom!! !